Trade Classics > Classic Car Blog > How Do I Import a Classic Car into the UK? How Do I Import a Classic Car into the UK? Importing a classic car can be a complicated affair and depends on both your own circumstances and also that of the car. It’s also different when importing from within and outside of the EU. There really is a lot of conflicting and confusing advice on forums / other sites. So in order to make sure I give you accurate advice I’ve done a lot of research and even called HRMC to confirm the somewhat confusing Import Duty and VAT position. So I thought I’d write this article about the process for importing a classic car from the EU (European Union or Community), e.g. Italy, France, Germany and Spain, and also highlight the differences from outside of the EU; like USA and Australia. I’ve also written a generic blog on the UK registration side of importing a classic car, i.e. what to do once your lovely classic car hits UK soil – click here. For the moment, I am going to assume that you are a private individual car owner who wants to import a classic car for non-business reasons and not for re-sale. Here are a few actions / considerations you’ll need to think about before embarking on bringing your dream car or motorbike back into the UK. Do your research, i.e. what type of classic car or motorbike are you looking at, how much do they sell for in their country and how much would it be worth in the UK. After all you don”t want to go through all this hassle if you could buy an equivalent vehicle for the same price – you must make sure their is a healthy difference to make it worth your while. When you’ve done enough research then see Section 2 and either 3 or 4 below based on where you are importing the car from, this is to work out the total cost of the car after importation. It”s a much simpler process to import a car from mainland Europe, e.g. Italy, Spain, France or Germany. a) No import Duty is liable – as it”s a movement of goods around the EU. b) Also no VAT is liable – this is because VAT would have been paid in the country of origin on its original purchase. Make sure the car has a local MOT, e.g. a “revisione” for an Italian car (important if you plan of driving it back). Make sure you insure the car – especially if you plan on driving it back home. You will need to use the car”s VIN number as you won”t have the new registration number until later in the process. Most classic insurance companies accept this identification and will issue a certificate. In some EU countries you need to apply for temporary plates, e.g. in Italy the number plate is assigned to the driver and not the car – this is an additional cost and can set you back about 400EUR for signing the property document and 175EUR for the temporary plates. If the seller trusts you then you could use their plates to drive it home (if they don”t need them) and you could send them back in the post when you get to the UK. Collect the original copy of the temporary registration document. Collect the official declaration of sale with the sale price signed by you and the seller and a Notary. Obtain a Certificate of Ownership. b) Drive or Transport the Vehicle back to the UK. c) Notify HRMC and organise the car’s MOT. Also, there are a couple of ancillary fees to add, namely a Customs Fee of about £50 and a DVLA registration fee of £55. Logistically this is more complicated and also more expensive as it also involves the near certain liability of Import Duty and VAT. Classic cars coming in from outside of the EU will be subject to Customs Duty and VAT, as they are considered to be “new goods to the EU”. I really recommend you contact an experienced importing company to help you with this process, however, the following will outline the steps you need to consider and will give you more knowledge on the subject. a) Purchase the car in the country of origin – make sure you obtain key documentation, e.g. sale agreement, registration documentation. b) Ship the vehicle back to the UK via a trusted shipping company. d) Notify HRMC and organise the car”s MOT. Importing cars that are over 30 years old reduces VAT liability by 15%, as just 5% is charged against the cost of the car. This could mean a significant amount of money difference on ‘modern classics’ e.g. if you purchase a 1986 Ferrari 328 GTS for $100k then you will save circa $15k on the cost of import. So when you’re looking at potential cars then be careful as just a one day difference in the registration date could be a significant extra cost. UK customs have their own exchange rate for calculating VAT and Duty and it’s updated on a monthly basis – use this to work out the latest exchange rate – click here. Note: yes Duty is added to this calculation as it is also subject to VAT too. 4.2 Importing Cars Under 30 Years Old – 20% VAT Liability. As mentioned above – 20% VAT is charged and you’ll need to pay this when the car arrives into the UK. Note: Duty is added to this calculation as it is also subject to VAT too. If the car you’re purchasing was originally made in the EU then this will reduce your total Duty liability from 10% to just £50 admin fee. Again a significant saving if you’re planning to import cars from manufacturers such as Porsche, BMW, Mercedes and Jaguar. So if you’re looking at a non-EU manufactured car such as Ford, Chrysler, Toyota and Cadillac then your total Duty liability will be the full 10%. Duty is calculated as: $ Invoice Cost + $ Shipping Cost / Customs Exchange Rate * 10% = £ Duty. Here”s a link to a handy online calculator to help you work out the costs – click here. 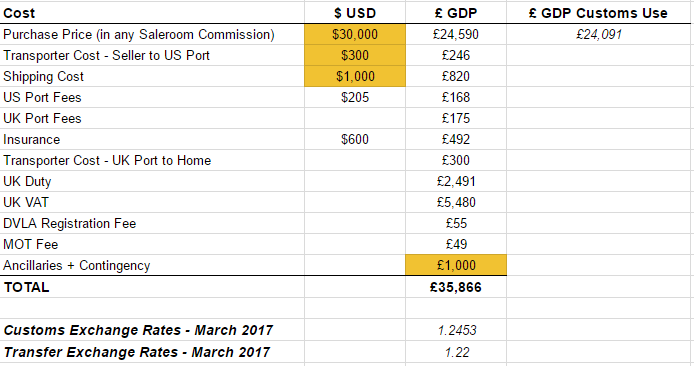 This is one of the larger expenses – you can generally count on circa $1000 for shipping costs from a USA to a UK port (Tilbury / Southampton / Felixstowe) for a shared container (two cars in one container). RORO (Roll On Roll Off) is cheaper but I wouldn’t recommend for a high value classic car. 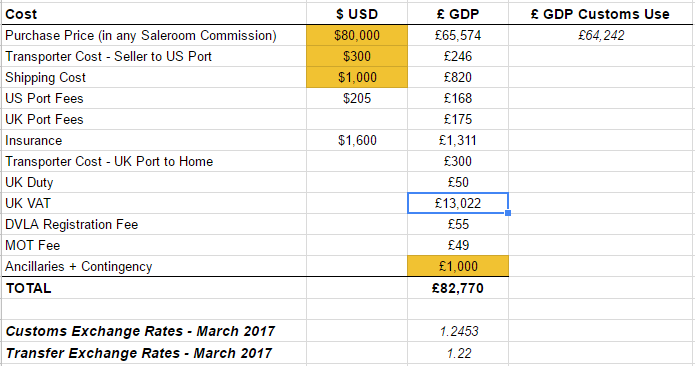 Also, remember you’ll need to get the car to a US port and that could increase the costs significantly. For example, it may cost circa $300 to securely transport a car a hundred miles or so to the nearest US port, but what if your car is in Texas and has 1,000 miles to get to a nearest port; well that could be another $1000 on top. So your car has cost a few dollars and you want to make sure you don’t lose out if the worst happens like the ship goes down, or the car suffers damage in transit. Well you’ll need to think about insurance and that will roughly cost you 2% of the total cost of the car. So that Ferrari 328 GTS you’re thinking about for £100k will cost you $2,000 in insurance. Of course you could cut corners and leave this out – if you dare! 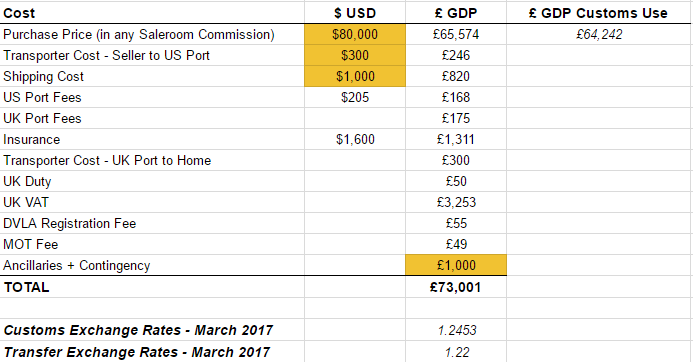 USA port fees will be just over $200 and UK fees at £175 at the time of updating this blog (March 2017). So quite reasonable but make sure you include it as it all adds up. Don’t forget you’ll need to get the headlights amended for UK roads and get the car MOT’d – depending on the exotic nature of the car this could cost you a few hundred pounds. I’d personally recommend you put £1000 by for this work and any other unexpected bills / parts you may need. You will need to get the car MOT’d first after the legal modifications to lights have been made – this will cost you circa £50 depending on your chosen MOT station. Once that is done you can then apply to the DVLA for registration to get the V5 logbook – this will cost you £55. Okay so there was a lot to take in there – let’s look at a few examples for importing a classic car from the USA. – EU and Non-EU Manufactured Cars – If you are planning on importing an originally EU manufactured car to the UK from outside of the EU, e.g. you import a Porsche 911 from California, then the Customs Duty is waived (just £50 admin fee). However, UK customs will need to see evidence that the car was originally exported from the EU. In order to prove this, you can provide a copy export entry, the export invoice or the export bill of lading/airway bill. If none of these documents are available, you could also try to get hold of an official letter from the manufacturer which confirms that the car was fully manufactured in the EU. Please bear in mind that this needs to be ‘official’ and therefore needs to be on company-headed paper, and signed. If you can’t provide one of these pieces of evidence, then unfortunately you will have to pay import Duty and VAT, as if the car was newly entering the EU. UK customs will not except that a car has to be EU made just because the manufacturer is European! – Importing Cars Over 50 Years Old – If the car is over 50 years old, coming into the UK from outside of the EU, then you don”t pay any import Duty and pay VAT at a reduced rate of just 5% as it”s classed as ‘historical interest’ under the 9705 ‘Goods of Historical Interest’ clause. – Importing Cars Over 30 Years Old – If the car is over 30 years and under 50, coming into the UK from outside of the EU, then it may be also be officially classed as ‘historical interest”, under special circumstances and like cars over 50 years old means that you don’t need to pay import Duty, and that you pay a reduced rate of VAT at only 5%. However, in order to qualify for this, you will need to complete the ‘Binding Tariff Information’, this is basically a request for reduced import tax which you need to obtain from HM Revenue and Customs. For example, it may be very rare, have been used for a particular purpose, or owned by a famous person etc. If you think that this may be the case, then you can write to customs and ask to be considered under the 9705. However, I can reliably tell you the chances of obtaining this cause is very slim based on peoples” past experiences written up online. My advice: don”t waste your time unless the car was owned by Elvis and pay the normal Duty / VAT. Here’s a link to a guide on the UK Government”s website – click here. And a link to HRMC’s guide on VAT and Duty – click here. That’s it, a lot to take in and different rules based on where the car is being imported from, but hopefully will give you the necessary steps to follow to make sure there are no nasty surprises. Please remember, once you have your car through customs process, you then need to contact the DVLA in order to understand the registration process for your imported classic car. Please read my article ’How do I register an imported classic car in the UK‘ for more information on the process. HI, I Want to buy a car in the Netherlands and drive it home. I have contacted two Classic Car Insurance companies who will not insure it till it is in the uk. What am I missing? You will need to insure and MOT the car before you apply for the V5 as you have to send off proof of insurance and a valid MOT certificate with the V55. Also you will need the Nova form from the HMRC stating that the taxes have been paid. It sounds awkward but it is actually very straightforward if. I’ve found an old Renault in France , it’s been sat for years but there’s no reg documents or any paper work with it , how can I go about bringing it to the U.K. If I buy a classic tractor (1963) so over 50 years old, from a non eu country, do I just pay the 5% on total including shipping? Thanks PS. Excellent article by the way! Tractor was manufactured originally in Germany. I have a restored 1957 jaguar mk8 in New Zealand and would like to ship it to the UK and sell it. Is this possible and what would be the vat and duty liability? Hi Emma, Great article… But I would like to know – I bought a 1985 BMW M635 CSI In the UK 10 years ago, and brought it to Australia, where I have been living. If I Imported the car back to the UK, would there be any UK VAT or duties payable? If you look at the important notes section 6.0, there is a chance that since the M635 CSi was a rare car, it might be deemed as having historical interest and so a reduced VAT of 5%. Worth taking a look at. hi I am thinking of purchasing a mga 1956 which has been imported into the UK from Australia.The owner now wants to export it back to Australia because the cost of keeping and registering it in the UK is too much. It has been advertised here in Australia at a very low price,?. Comments please. I have had a similar experience with a jaguar advertised in Australia but now in UK. Owner was unaware of 50%? Import duty and wanted to ship the car back. Also advertised here at low price. Wonder if it is a scam? I want to Import a classic car from outside of the EU to the UK NOT Made in the EU! Soviet Gaz 21 1964.How much I’ll pay vat and duty?? And do I need to proof somehow that this car is no longer in production?? I have just imported a 1967 Jaguar E-Type from the USA to the UK, how do I get the vehicle history? I have the VIN number and was wondering if there was anyone who could advise me on where I will be able to obtain this information from? Contact Jaguar heritage in the UK, who for £45 will send you a heritage certificate for your car, giving the date of manufacture, the destination country and city, along with the numbers for the chassis, engine and gearbox. If you check in the USA try Carfax who should have an online facitlity to show the history of your car in the USA. I have the chance to purchase a 1953 split screen Morris Minor in South Africa, although this car is in good condition there is no registration documents, is this going to be a problem if i was to export it for sale in the UK. Hi, great article…I have a couple of questions…..I am in USA, would like to give my all original 67 camaro to my daughter, UK/USA dual citizenship…..will there be any vat if the car is free? The engine is original, if I would install a 2002 ls 5.3 engine for reliability and drivability, would that change the 50 year old status? Would it be better if I own the car til it gets to UK?, Or if the transfer takes place before we load it on the boat? Thanks! We have purchased a Mustang in the USA from a mother of a friend of ours. The friend is in the motor trade and has renovated the vehicle at our cost. it will not be long before it is ready for shipping.What must be taken into account when informing the customs. The vehicle has not been modified in respect of changes to ability but as you can imagine on a 1965 car things have been replaced like new wheels, the electrics have need updating, and headlights changed for our roads. it has also been re sprayed. Im looking to buy a car bro Itlay and I want to ensure its not stolen/ damaged etc How do I check? Are these rules the same for importing a car from Bahrain in the middle east? Hi Ashley, yes these rules apply. You’ll see section 4 explains the rules for imports outside of the EU. Hi Emma, I have seen a car in Texas on ebay that I would like to buy. Its a 1956 model so its 62 years old. It will be tax and MOT exempt here but of course the lights would need making legal. My question really is: will I have any import tax to pay? Hi Emma, excellent article, very well done indeed. Is this guide applicable to motorcycles as well? Cheers. Hi Mike, we believe it does.. yes. Hi, I’m looking at importing a VW Golf 1978, I’m trying to decipher import/VAT charges that this will be liable for. It’s 40 years old born in Germany, I’m a bit confused as to whether it qualifies because it is “at least 30 years old and of a model or type which is no longer in production” but obviously the Golf is still being made today. Any help would be appreciated! The rules above apply. So section 2 if importing from Europe or 3 rest of the world. All the best. how can i do this,what is the procedure? Excellent article thank you. I note in your introduction that you make an assumption “you are a private individual car owner who wants to import a classic car for non-business reasons and not for re-sale” . Can you advise what restrictions are placed on a sale following importation? Good check list. For cars from the US to the UK, Import Car also lists the various steps, including registering and has a lot of useful links to specialists at each stage. Just read the article, BRILL and I’m taking from a Logistics / Customs Clearance point of view. The number of calls when importing cars from clients “why am I paying Duty / VAT” . Why Do I have to fill all these forms in. Great Article. Hi,Ive just bought on a merc 190D 1992 in germany,it has a TUV till 2018 and is in very good working order only covered 45000 km .The dealer will deliver to me, however how could I get a uk reg for the car so I can drive back to the uk and insure? Hi Tony… you’ll have to follow the steps in this article. You can only get a UK number after you’ve imported it and got it MOT’d. Thank you so much for your article Emma, fantastic and incredibly thorough. I have recently bought a 1967 Lancia Fulvia from Bologna,Italy and had it transported back to the uk through a private transporter firm. The car failed its MOT in the UK but I am presently having the works carried out. I have not as yet informed the DVLA as I’m waiting for the car to be up and running. Should I have done this already? Also will I be liable for the import duty, this was not clear to me as the cars over 50 years of age? 2. DVLA only after you have got the car through an MOT to apply for a V5 registration document. Regarding the Duty question; the car was made in the EU and is over 30 years old so you should just have the £50 Admin fee to pay. HMRC will confirm this position with you when you contact them. Thanks for this article Emma. We are currently driving our South African registered, 1988 Toyota Land Cruiser up through Africa with the intention of importing it into the U.K. when we’re done. As a result your article is very useful. One question, you mention the positive VAT implications for cars over 30 yrs old. Is that from year of manufacture or year of registration?